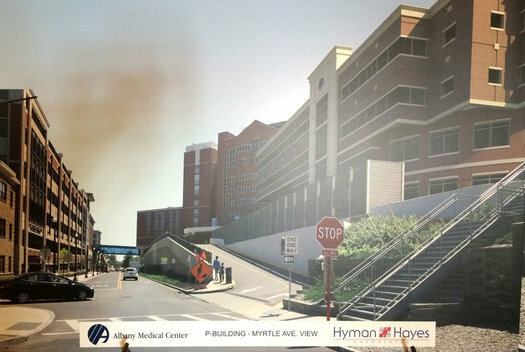 One of the new views of the proposed new Albany Med building along Myrtle Ave. That proposed building is on the left. The building on the right would be demolished later on as part of the project. The proposed new building on the Albany Med campus in Albany has a new look. 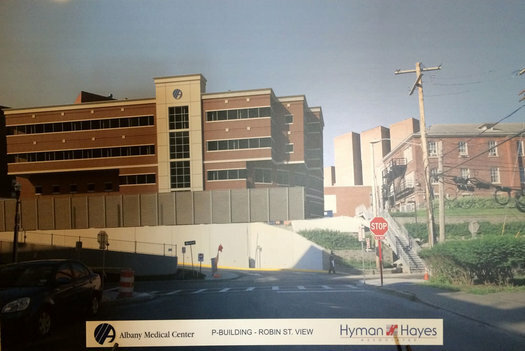 Last month reps for Albany Medical Center appeared before the city planning board to pitch the plan for a new 5-story, 74,000 square feet building along Myrtle Ave that will house a new pediatric emergency department and offices. Two existing buildings would ultimately be demolished for the project. That public comments last month focused largely on how the building's appearance and profile fit -- or didn't -- into the context of the adjacent neighborhood. So Albany Med reps were back this month with an altered exterior design they said would better match the multiple other buildings constructed recently around the center's campus. Among the new details: A uniform brick color around the building, and new stone accents. The renderings also now show a fence planned to serve as a screen of various utilities. 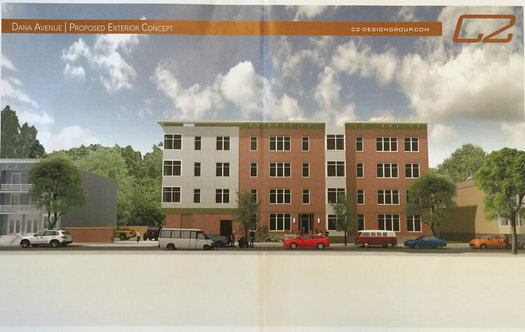 Also notable about the new renderings: They show a view of the planned building as it would appear from Myrtle Ave. The site of the building sits about 20 feet above the street, and there had been questions during the previous presentation about how it would actually look from that perspective. Part of the discussion with the planning board this time around touched on the potential of extending a new sidewalk along the south side of Myrtle Ave at the site. (A sidewalk there has been on the neighborhood wish list going back to debate over the new parking garage across the street.) AMC reps said they're looking at the possibility, but the situation is complicated by a 30-inch city water main that runs inside the hill there. Adding the sidewalk would involve excavating part of the hill, and how that would affect the water main isn't clear right now. AMC is still working through some of the technical issues related to the project with the city's various departments. But reps said Thursday they hope to be back before the planning board for site plan approval next month. In the meantime, the board granted demolition approval for the site on Thursday. The 191 N. Pearl Street project was back before the board Thursday and got site plan approval. The new construction project includes 18 apartment units (and parking space for 15 vehicles) on a lot at the corner of N. Pearl Street and Wilson Street (a block north of the Palace). The developer behind the project is Rudy Lynch, who lives nearby in a converted warehouse space. He told us Thursday after his project won approval that he sees a lot of potential for that section of town because of its location. As he said to us, "I think that area is ready to explode." The project will include 15 one-bedroom units and 3 two-bedroom units. Lynch said he expects rents to be in the $1,200-$1,400 range for the one bedrooms. Parking will be extra. Lynch said he's currently working with the Albany IDA on a payment in lieu of taxes arrangement for the project. If that comes together soon, he said construction could start in November. Another project that won site plan approval Thursday: The Capital City Rescue Mission's plan to convert two floors of a building at 127 Arch Street in the South End into apartments. The building is old warehouse space around the corner from the mission's main shelter on South Pearl Street. The plan is to build out 14 apartment units in which women and their children will be able to stay as they make their way back from being homeless. We got a chance to talk with Rev. Perry Jones, the org's executive director, for a few minutes following the project's presentation Thursday. He said the idea for the apartments follows on the success of 40 apartments the mission already has for men. Jones says that program has gone well -- he cited a 90 percent success rate for the men staying there. "I think it's going to be a plus for everyone." The apartment space will also address a gap in the local web of services for women and their families dealing with homelessness. When the project made its first appearance before the board earlier this summer, Common Council member Vivian Kornegay, speaking in support of the project, pointed to the shortage of housing in the city for this sort of situation -- she cited the experience of constituents who had ended up at housing in Menands because there wasn't a place for them in the city. Jones said Thursday that the Rescue Mission still needs to get the various construction permits for the project, but if that all falls into place soon, construction on the conversation could start this mid-to-late fall -- and he figures it will be finished within two years. He said the mission makes use of donated materials, services, and labor to keep costs low. If you'd like to donate -- money, time, services, or materials -- there's info on how to do that at the mission's website. Up before the board for the first time Thursday: a proposed new construction residential project at 79-91 Dana Ave in Park South that would include 30 units and 13 off-street parking spaces. The project would demolish three buildings currently at the site and would also make use of empty lots. 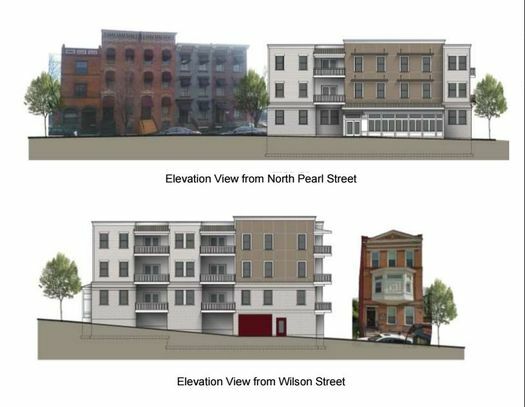 The plan appeared to get a somewhat reserved reception, with discussion focused on whether the project involved adequate parking and whether the four-story building would be visible above the row houses that line Madison Ave behind it. Common Council member Richard Conti appeared during the public comment period to note that when the council recently approved changes to the Park South Planned Development Overlay District that opened the way for a four-story project on the site, the proposal in circulation at the time was for a project in the 20-unit range. Conti did not say he was opposing the project, though -- he did recommend the developers meet with the Park South Neighborhood Association. Ron Stein -- whose RECKDE, LLC is backing the project in partnership with Maddalone and Associates -- said afterward that the project isn't financially viable at 20 units. But it sounded like he was willing to make changes to accommodate the feedback -- whether that was some reduction in the number of units, a reconfiguration of the parking, or trying to acquire an adjacent empty lot for more parking. The site of the potential project is just a few houses east of New Scotland Ave on Dana, and if you stand in front of the site, you can see the big, new residential/commercial project going up next to Albany Med. Stein, who already owns properties in the neighborhood, said he thinks there's a lot of momentum in the neighborhood right now, and the Dana project is an attempt to keep that going.